Wall by Greg Mike. You can also find him on Instagram at @gregmike. Found in St. Petersburg, FL. When traveling with your dog, it’s important to remember that traveling can be stressful for both you and your dog. 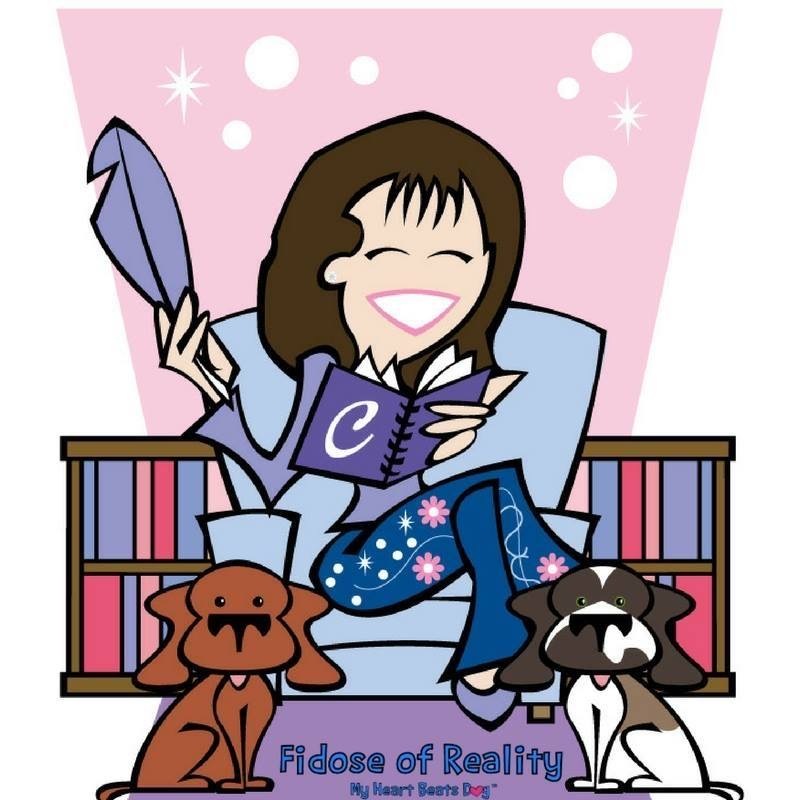 I can’t help with your anxiety and its effects on your health… but I can help your dogs! 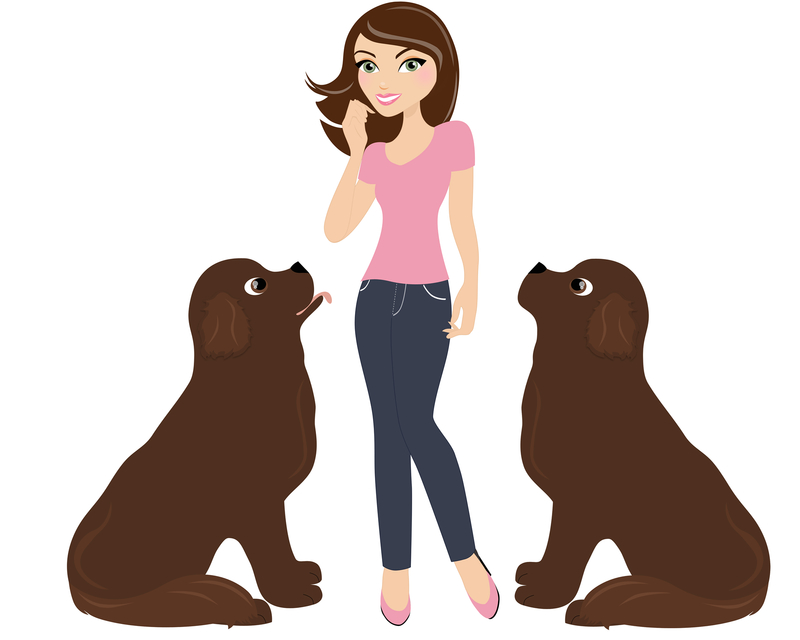 Here are some tips for traveling holistically with your dog. Get Prepared BEFORE Your Trip! 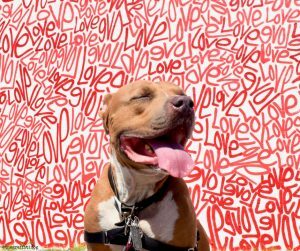 Stress and anxiety can affect dogs in many of the same ways as it does humans but a diminished immune system and GI disorders, such as diarrhea, are very common ones. 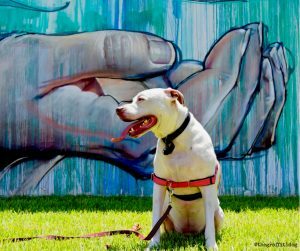 My deaf dog Edison and I just completed a fast-paced 700-mile road trip through Florida on a recent street art tour. We powered through 3 hotels in 4 different cities in 4 days. If that alone wasn’t stressful enough, each day was jam packed with driving, urban hikes in the hot summer sun hunting down street art, flicking photos, meeting new people on the street and at outdoor cafes, driving some more, checking into a new hotel and getting settled in a new hotel room. And then, each evening, we went exploring an unfamiliar city in search of a Starbucks where I could recharge (a bucket of iced coffee, please!) as Edison relaxed and recovered in the shade. So yes, stress and anxiety were on my mind. I knew before we left that Edison would be working hard and that I would be asking a lot of him each day, so I prepared ahead of time. I needed to keep him healthy and happy on this whirlwind of a tour! Edison’s health and well-being always come first- and traveling holistically is the best way I know to keep Edison healthy. This educational post about traveling holistically is sponsored by Dr. Harvey’s. I am being compensated to share my honest opinion and experiences with Dr. Harvey’s herbal supplements. 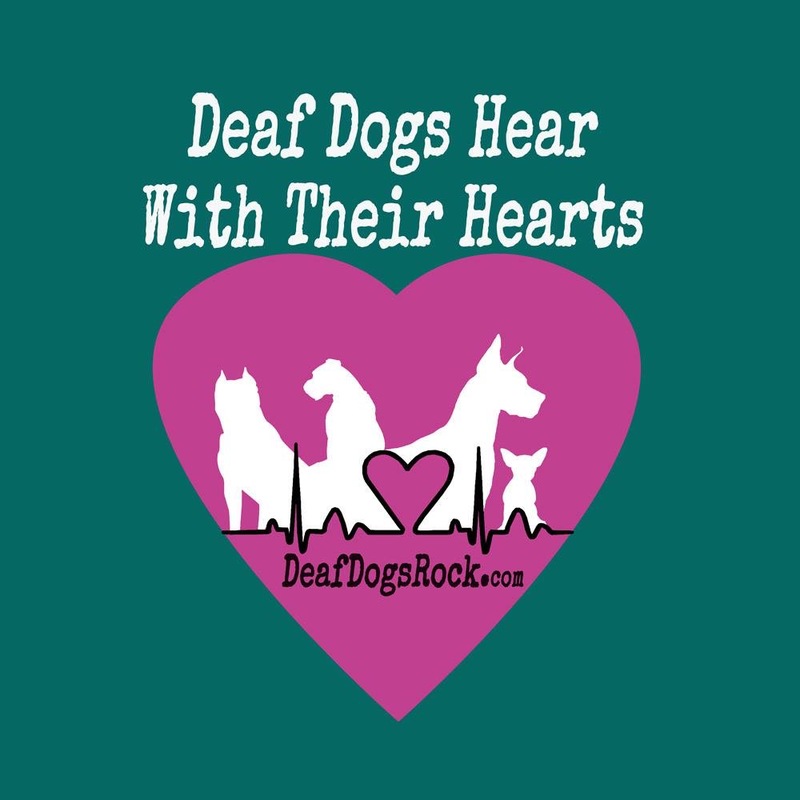 I only share information about products that I use and feel is beneficial to deaf dogs and my readers. Dr. Harvey’s is not responsible for the content of this article. 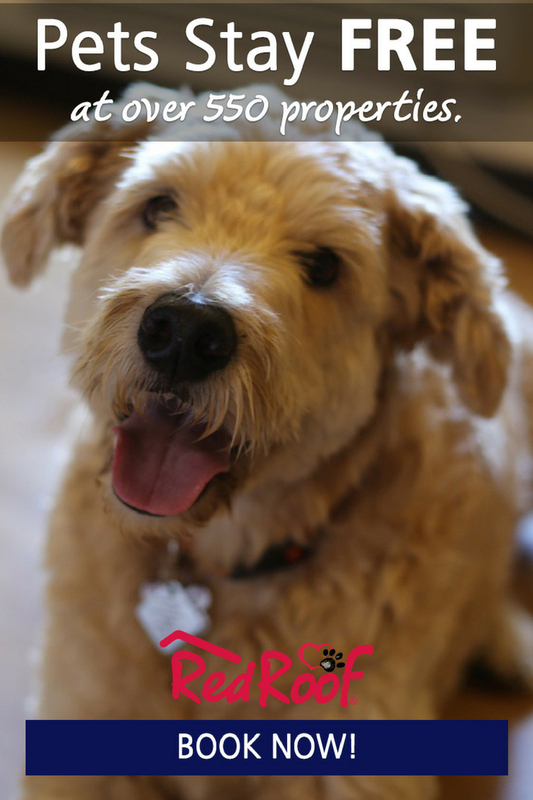 A healthy, nutritious diet is the foundation for achieving and maintaining good health for any dog. For this tour, I chose to feed Dr. Harvey’s Oracle Grain-Free complete dog food. With freeze-dried raw protein, all I had to do was add water, mix and wait for it rehydrate. What could be easier when traveling? 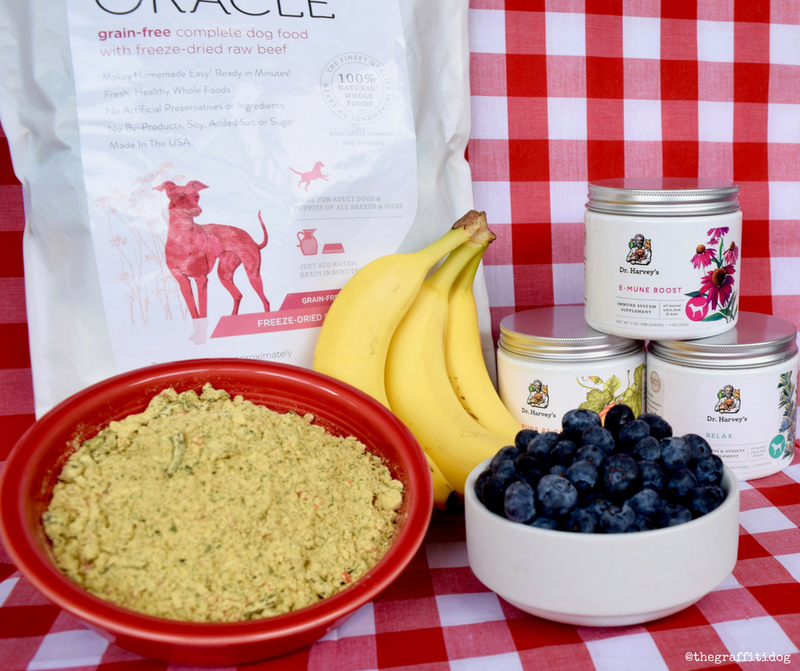 To learn more about why I chose Oracle and my experiences feeding it, check out this recent blog post, “Feeding Healthy Dog Food When Traveling”. 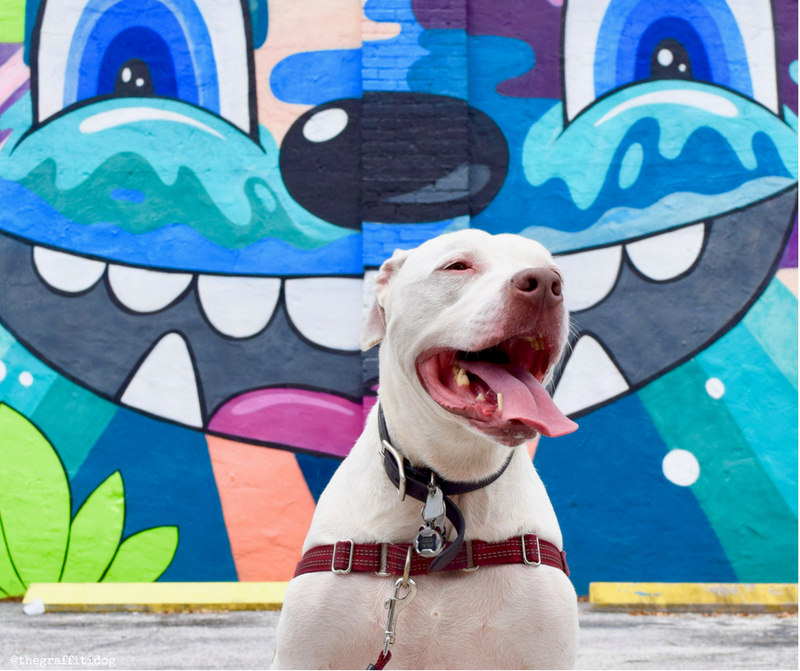 Edison and I spend a lot of time hunting down street art in Miami, but these adventures only last for a few hours at a time. This tour would stretch out for days and I knew we would be working hard and moving fast. So as prevention against stress, I brought along and used Dr. Harveys’ Relax herbal supplement. I had no real reason to believe that the trip would cause Edison any stress or anxiety, but I wanted to be prepared. We use Relax during fireworks with our dog Galileo, so I knew it was all natural, free of chemicals and safe for daily use. To learn more about why we love Dr. Harvey’s Relax herbal supplement, check out my recent blog post, “How to Relax Your Dog Naturally During Fireworks (& Other Stressful Times)“. In addition to transitioning Edison slowly to Oracle before the trip, I added Dr. Harvey’s Runs Be Done to his food when we were traveling as prevention against GI upset, soft stools or, god help our housekeeping team member, diarrhea! I chose Runs Be Done digestive tract supplement because, in addition to promoting regularity and healthy digestion, it contains powerful yet holistic ingredients, such as pumpkin, slippery elm, apple, pectin and other ingredients that naturally yet quickly help resolve loose stools and diarrhea. Despite a new food and the stress of a rapid-fire schedule, Runs Be Done helped keep Edison’s digestive system running smoothly. I was watching closely and every single one of his stools was completely normal! There are dosing instructions right on the jar of Runs Be Done- and every other Dr. Harvey’s supplement!- so you always know exactly how many scoops to mix into your dog’s food. P.S. Scoop included- so there’s no guessing or calculations required! 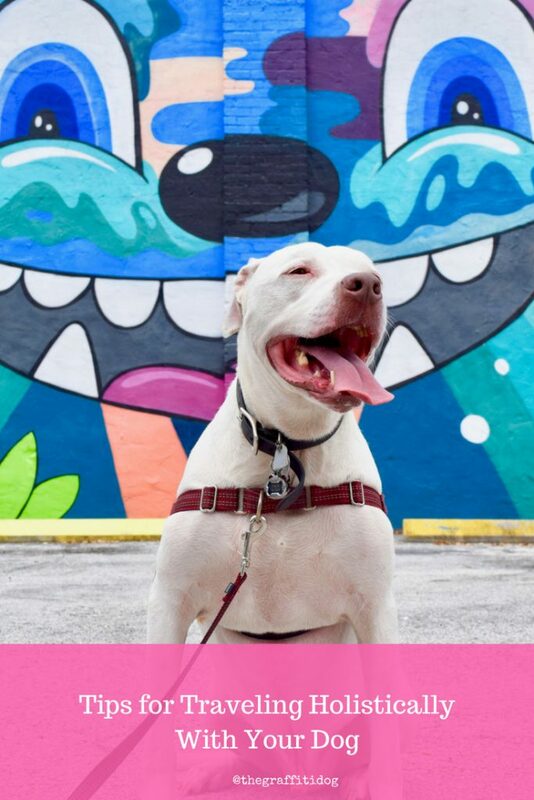 Stress can have a terrible effect on a dog’s immune system, so it’s important to boost it whenever your dog may be experiencing stress, especially prolonged stress over the course of several days- like say, I don’t know, a non-stop street art tour that cross-crossed the state of FL in 4 days! Though Edison loves traveling, meeting new people and having his picture made, I also knew that the tour and all that we we’re doing would likely increase his stress level. So, as a way to help make sure his immune system stayed strong, I added Dr. Harvey’s Emune-Boost herbal supplement to his meals. Emune-Boost is a blend of herbs traditionally used to help boost the body’s immune system and pathogen-fighting abilities. 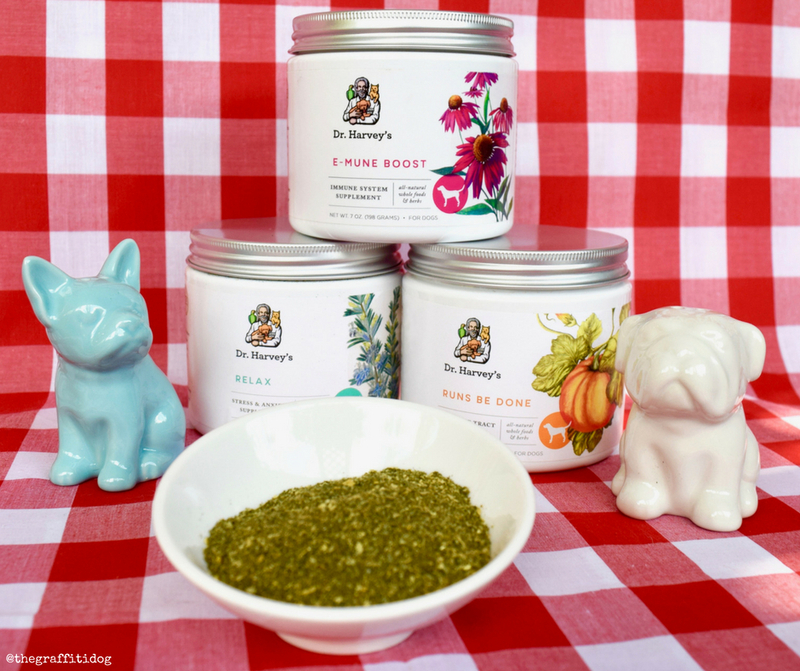 These herbs are mixed with whole foods that provide important vitamins and minerals to further support your dog’s immune system. You might recognize most of the ingredients in Emune-Boost as ones included in the immune system supplement YOU yourself take, such as Echinacea Root, Dandelion Root, Rosemary, Ginger, Milk Thistle and Thyme. Edison handled the tour and all the work involved like a pro. 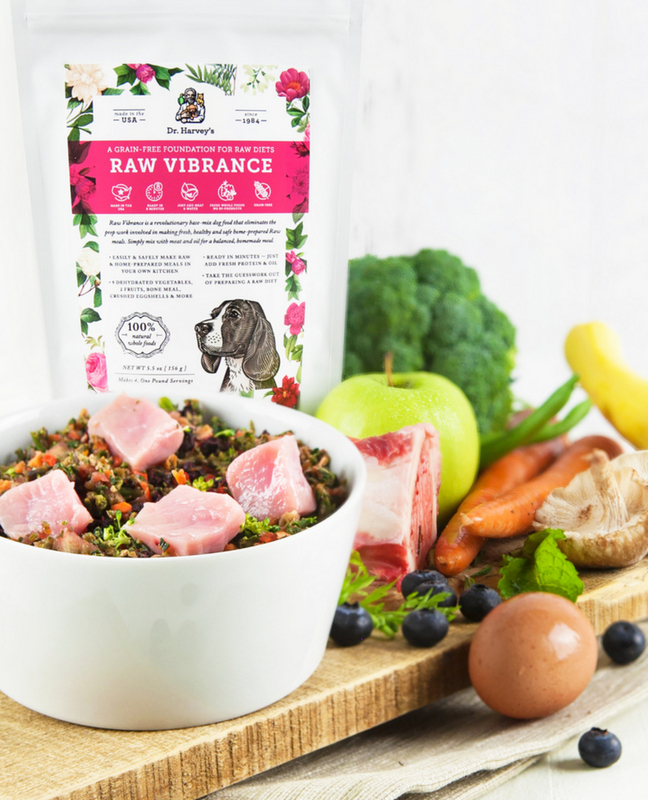 He was happy and enjoyed our adventures together…and staying healthy with Dr. Harvey’s holistic, travel-friendly food and supplements had everything to do with that! 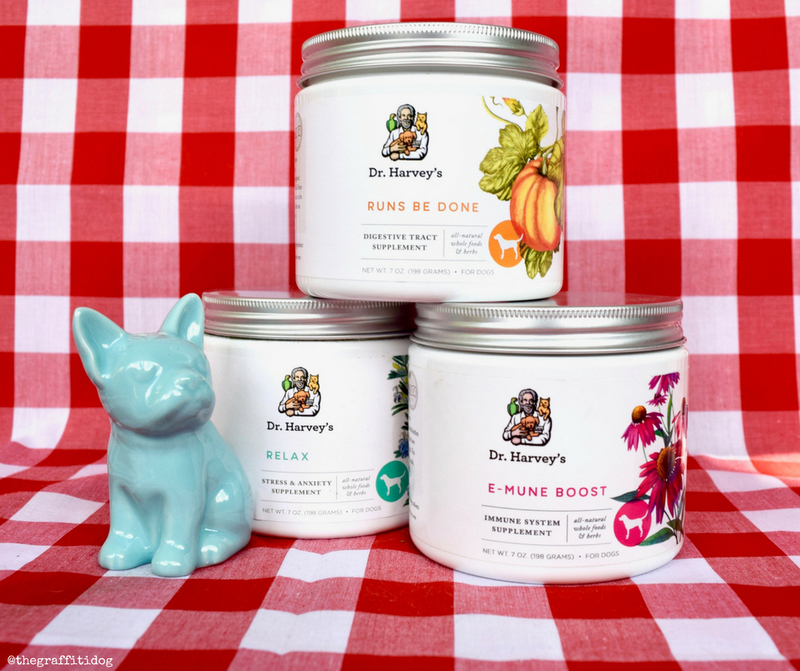 Since all of these products are offered by Dr. Harvey’s, it’s one stop shopping so you too can start traveling holistically with your dog! Use my Ambassador Discount Code TGD1218 and enjoy a 10% discount on everything in your cart! 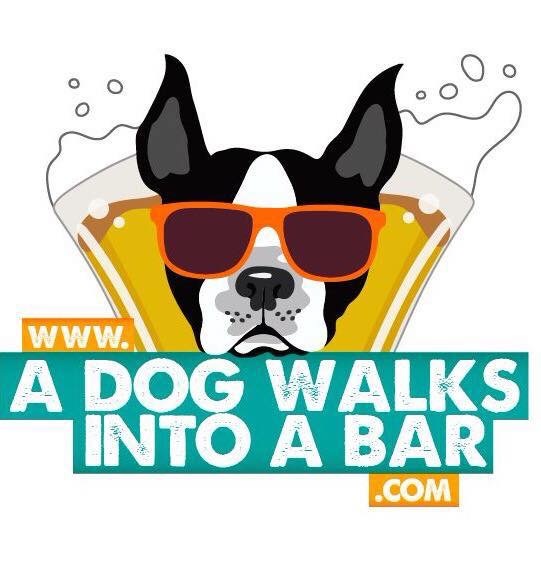 How do you keep YOUR dog healthy when traveling? I’d love you to share your tips in a comment below!